As a writer and speaker I share stories from the overlap of science and culture. This includes writing about science and art collaborations, but also pieces that highlight the culture of science itself. 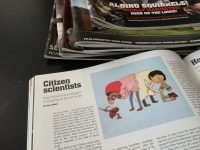 I occasionally write short articles for various publications, about the many ways science overlaps with daily life and culture. My favourite kind of writing is when I’m given a lot of time really dig into topics. These features and longer articles are a good example of that. 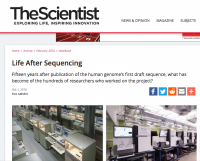 I’ve interviewed many scientists about their work and lives, either as part of longer profiles and articles, or as Q&A-style interviews. I give fun and informative short talks about the science/arts overlap, and the culture of science. Talks and writing about the overlapping lives of musicians and scientists. Over the last 13 years I’ve written an estimate of >1500 blog posts for various science blogs. These are just a few of them. 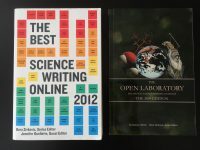 My writing has been included in two science blogging anthologies. In 2008 I wrote the fact sheets for the fourth season of the Canadian TV show ReGenesis.